"They met at the funeral of a perfect stranger. From then on, things got perfectly stranger and stran". The young Harold lives in his own world of suicide-attempts and funeral visits to avoid the misery of his current family and home environment. 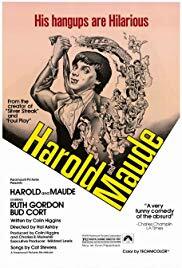 Harold meets an 80-year-old woman named Maude who also lives in her own world yet one in which she is having the time of her life. When the two opposites meet they realize that their differences don’t matter and they become best friends and love each other.